Thank you, Brooke! I'm so excited!! When I was 13, I snuck into a club & danced all night! I babysat the Jonas Brothers when I was a student at the Bible school where their dad led worship. I've never had a speeding ticket. We paid cash for our new house, thanks to Dave Ramsey. I was a leap year baby, so I've only had 8 actual birthdays. I'm so distracted by the construction behind my house that I can't think of any more lies! Which is the truth out of all those lies? I'll leave that up to you to figure out! These are all friends that I've made (virtually, at least) along life's road, & I love keeping up with them through this thing that is the blog world. I love reading about their lives, & I hope you'll check them out, too! 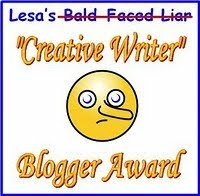 Thanks for including me - I posted the "lies" on my blog. :P It was fun - made me have to really think! I think your truth is #2 - babysitting the Jonas Brothers. i hope you paid cash for your house (i <3 dave ramsey) but that's a tough one. Is the last one the truth? Thanks for stopping by! I will say the last one is the truth. I'm orginially from Houston but now I live in Southeast Texas. My family still lives there. We should meet one day!! Have a great rest of your week. "How Could You Say No"